The Chain Bridge Honey Farm visitor centre was established in the early 1990s to allow the public to discover first hand the extraordinary tale of bees and honey. The comprehensive information found on the visitor centre walls was compiled by beekeeper and honey farm employee Ann Middleditch. There are sections on bees and bee behaviour, products of the beehive, including honey, wax and propolis, different types of bee as well as bumble bees and wasps and also information on swarms. All the exhibits are hand written by calligrapher Dorien Irving, and are themselves works of art. A popular display is the observation hive where a living colony of bees can be viewed behind glass. You might watch these fascinating creatures for hours, particularly if you embark upon a search for the queen! See the bees visibly bring in pollen on their hind legs and perform captivating dances as they ‘speak’ to each other. 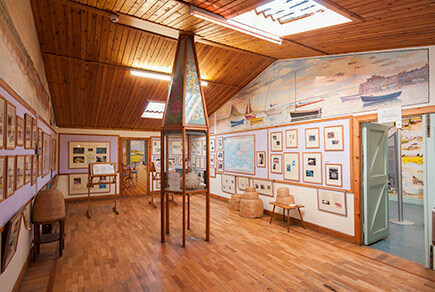 Adorning the visitor centre walls are intricate murals painted by local artist Tony Johnson from nearby Horncliffe. These include a pictorial map of North Northumberland and the Scottish Borders depicting no less than 110 different sites. An additional exhibit is Stephen Robson’s vast display of vintage vehicles, ranging from Caterpillars to rare Lanz Bulldog tractors and a stunningly restored ERF. A recent addition is our fabulous Beekeeper’s Garden which has been planted to attract bees, butterflies and other pollinators. Why not take a walk to the Union Chain Bridge which was completed in 1820 and is a suspension bridge that spans the River Tweed and links England to Scotland. To round off your visit take tea in the café situated in a double decker bus! Yes that’s right! Goodies available include honey flapjack, honey sponge and superb heather honey ice cream (made for us by Doddington Dairy).